I am not even going to pretend that I am not weird, or a little of an oddball. As emotionally exhausting, and alienating as that can be a lot of the time, it also gives me wonderful insights into things and allows me to look at situations from a different perspective. A random strand of this is that I am a very creative person. A unusual thing happened when I was on social media recently, and I came across someone’s twitter account. I instantly found myself developing a little online crush on someone (which is not the first time this happened) and so I scrolled through their account. The more I scrolled the more the journalist in me was unleashed, trying to figure out if this person batted for my team - using their pictures and tweets to decide if there was a homosexual undertone to anything they put out. I instantly became uninterested in this person when my research showed me they were heterosexual. In my mind, their opinions on an array of subjects was no longer interesting. It lost that dynamic and complex layer of thinking that I had interpreted as being there. The person just became another cisgender heterosexual male, who I am sure is intelligent, cool and has something that makes them idiosyncratic, but whatever that was I could no longer see it. Something that made them stand out in my mind, vanished. It was in that moment this new word pop into my mind – HETEROBORIA. 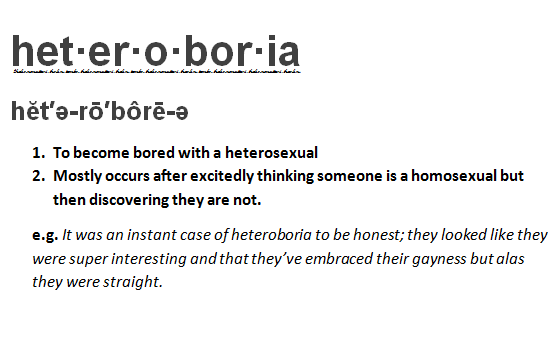 The word would come from putting the roots of heterosexual (hetero) and bored (bor) together to come up with this word –heteroboria. Sometime passed and I still thought about this experience. The more I would come across someone on social media who I thought was interesting, would then become less so once I saw that they were heterosexual. I was being a little tongue-in-cheek and made a picture of this Theo-ism (a theo-ism because my name is Theo and it is something I made up). Once I did this, I spammed all my friends with my creativity saying “Look at how genius I am at coming up with this NEW word”. My friends indulged me, and appreciated how weird I was being, but while chatting with a fellow gay friend, he pointed out that a few days before he had experienced the same type of feeling. He was having a chat with someone else and in this conversation he had ended up describing the feeling of heteroboria. Besides feeling validated, I could only just laugh about it. While this word is probably not going to redefine the use of the English language, and I will probably not receive any awards for it, I can at least appreciate the fact that my unique perspective on this allows me to come up with such eclectic things. If nothing else comes from this, I can rest contently knowing that I created a word that entertained the loved ones in my life, and made someone smile. 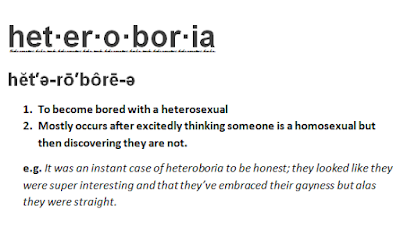 PS – While I can admit to not have the best grammar, and my spelling isn’t always flawless, it is trippy seeing the number of times the word heterboria was underlined as I typed this. Lol.